On January 16, 1979, the Shah of Iran fled the country. By February 11th, his regime had been destroyed. In the United States, it’s not often acknowledged that the Islamic Republic of Iran is less than 40 years old, nor that it came into being in the same way we did — by ejecting a monarchical regime. It’s also never mentioned that not everyone who deposed the Shah was in favor of Ayatollahs running the country afterwards. 1979 Revolution: Black Friday makes an effort to remind us. 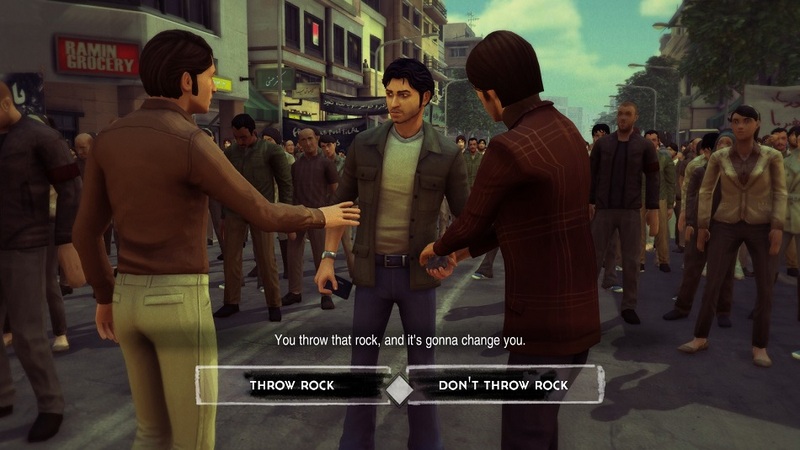 Despite the name, 1979 Revolution takes place in 1980 and 1978, with a frame story in the later year tying back to events immediately preceding the titular Black Friday. It’s not a confusing setup, but it doesn’t have much to recommend it — the part set in 1980 conveys that the clerical regime which followed the revolution was just as abusive as the monarchical one that preceded it. 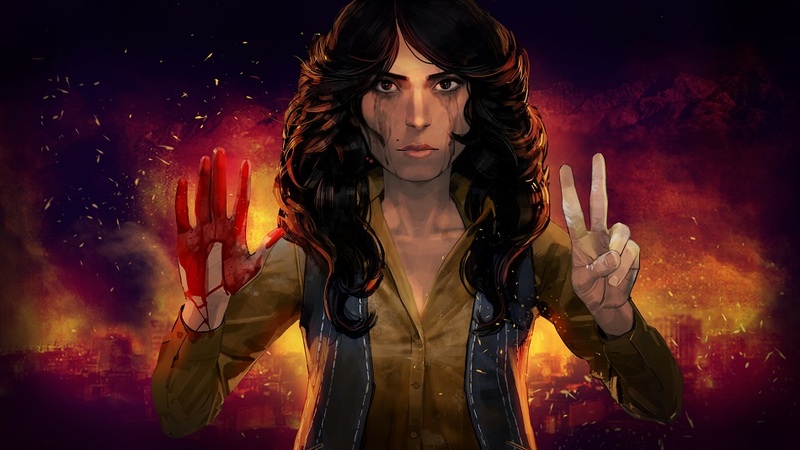 The segments in 1978 aren’t particularly relevant to the interrogation that main character Reza Shirazi is suffering through in 1980 so there’s no clear reason to employ the structure, and there’s no tight connection between the two periods. The story happening in 1978 is actually interesting, and Black Friday would have been well-served to tighten its focus there. In that tale, Reza and his friend Babak attend a mass protest against the unjust regime of Shah Pahlavi. Reza is a photographer and the player is called upon to make use of his talent. Reza’s photography minigame is one of the main activities in Black Friday, and it works reasonably well. The goal is to find a point of interest in the field of view, possibly zoom in, and then snap the picture when it’s in focus. In practice, this means following a little indicator at the bottom of the screen and tapping A when it’s in the center. Frequently, Reza will stop in front of a point of interest, and in these cases it’s relatively simple to figure out what to snap and do it. However, Reza will sometimes stand far back from the action and the player will have to hunt for hotspots. Black Friday doesn’t provide any assistance in finding these and also doesn’t communicate how many there are, so at times I felt a little lost. In addition to shooting things with his camera, Reza is sometimes called on to take action. This is always through QTEs that require prompt twitching of the stick or hammering of the A button. In a few places Black Friday does a poor job of conveying just what one is supposed to be doing, but I managed to muddle through adequately. 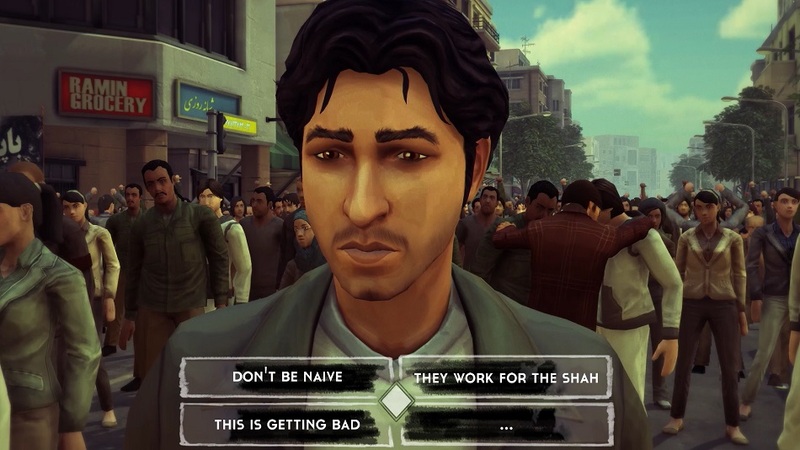 More often than taking photos or performing QTEs, Reza will walk around locations to inspect objects and engage in timed multiple-choice conversations. A lot of this activity is meant to illuminate the society of the time and the motivations of the Iranian revolutionaries, as befits the historical bent of the game. While Black Friday has a clear negative view of both past and present ruling regimes, it takes what seems like a fair-handed approach to the various factions of revolutionaries, including the Islamists. Similarly, Black Friday doesn’t elide the tensions that would certainly arise when communists, Islamists, mujahedin and pacifists try to build a unified movement to topple a king. Unfortunately, that comes to a head in Black Friday’s silliest incident, an attempt by Reza to find a mole in the revolutionary organization. During that I learned more about sandwiches than about the infighting. Why? Because Black Friday includes a rich library of explainers about Iranian culture, politics, and history surrounding the events of the revolution. Unfortunately, at least on Switch, this info is nightmarish to browse and read. The UX for navigating the topics makes it impossible to see which one is currently selected, and trying to move through pages with the shoulder buttons leads to bizarre results with pages out of order and an inability to move back to the page I moved forward from. Some of the formatting of these explainers also broke, leaving sentences that end partway through. Otherwise I noticed no serious problems on Switch, although the game was oddly aggressive about forbidding screenshots. Disclosures: This game is developed and published by iNK Stories. It is currently available on iOS, PC, PS4, Switch, and Xbox One. This copy of the game was obtained via publisher and reviewed on the Switch. Approximately 4 hours of play were devoted to the single-player mode, and the game was completed. There are no multiplayer modes. Parents: According to the ESRB, this game is rated M and contains Intense Violence, Blood, and Language. The game is very intense in places, and it includes moments where soldiers massacre civilians and various characters are beaten, tortured with a cattle prod, stabbed, or shot to death on screen. This may be a little hard to get through for some adults, so please consider carefully whether your children are ready for something like it. Deaf & Hard of Hearing Gamers: Black Friday has subtitles for most text, but occasionally they differ from the spoken dialogue or simply don’t show up. Subtitles are in white with a slight background effect and cannot be resized. Remappable Controls: No, this game’s controls are not remappable. This game does not offer a controller diagram. Movement is on the left stick and the face buttons are used for most interactions. Shoulder buttons are used to navigate certain menus. The game has QTEs that require mashing a button; there is no option to change this to a hold.